Wind World (India) Limited has two separate plants for assembly of wind turbines at Daman. Together these occupy a total surface area of 2,500 sq. mts. and have an annual production capacity over 1000 MW. 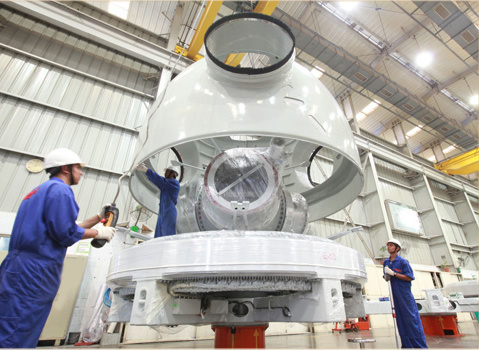 The Nacelle is the main housing of the turbine, which is assembled with the yaw drive, it is directly mounted on the tubular tower. The main carrier is a single cast frame that permits stable mechanical behavior and performance. Rotor head production comprises the manufacture and integration of the pitch drive, bearing, axle pin, stator-rotor and balancing assembly, under a single roof. The rotor hub or unit along with pitch drive and annular generator are interconnected to form a single gearless unit. The rotor unit is then mounted on a fixed axis, called the axle pin. As compared to conventional geared systems with a large number of bearing points in a moving drive train, our drive system requires only two slow-moving taper roller bearings, due to its low direct drive speed @ 25 RPM. Bearing fitment is executed using the shrink as well as induction heating techniques. Wind turbines are equipped with a variable pitch technology. This allows for feathering the angle of the blades for each wind speed; whereby controlled extraction is done using the maximum energy in the wind flow. In below-normal wind conditions, the pitch is tailored to derive maximum energy potential; while in above-normal conditions, the pitch is altered to derive a controlled amount of energy, so that the machine produces the rated power in a controlled and stable manner up to cut out wind speed. Besides maximizing wind energy derived, this system reduces torque on the device and allows for the use of the full blade as an aerodynamic brake. At every stage of assembly standard quality checks are executed as per our quality protocol requirement. This is executed by trained personnel using high quality calibrated equipment, to provide evidence of product conformity to requirements. After assembly of the Nacelle and Rotor Head, specialized care is taken to mount the composite equipment onto specially constructed trailer beds that are hauled to their destination on the wind farm.